The IBM® Smart Analytics System is a fully-integrated and scalable data warehouse solution that combines software, server, and storage resources to offer optimal business intelligence and information management performance for enterprises. 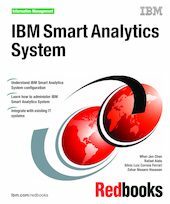 This IBM Redbooks® publication introduces the architecture and components of the IBM Smart Analytics System family. We describe the installation and configuration of the IBM Smart Analytics System and show how to manage the systems effectively to deliver an enterprise class service. This book explains the importance of integrating the IBM Smart Analytics System with the existing IT environment, as well as how to leverage investments in security, monitoring, and backup infrastructure. We discuss the monitoring tools for both operating systems and DB2®. Advance configuration, performance troubleshooting, and tuning techniques are also discussed. This book is targeted at the architects and specialists who need to know the concepts and the detailed instructions for a successful Smart Analytics System implementation and operation.